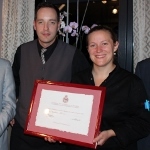 After a superb dinner, the President handed over to Stephanie Thunus, talented young chef of Au Gré du Vent the "Prix de Haute Gastronomie" 2014 of the Club. A well deserved reward. Many guests came to applaud the talents of Stephanie. Each of the preparations emphasized creativity, accuracy and match of the flavors of top quality products from the market. After a selection of original and tasty appetizers, the first plate: Crayfish-fennel-tomato water was beautifully fresh and delicately scented. Wild line caught hake-mussel-soft chorizo, the second dish, artfully presented, was highly acclaimed for its quality and the perfectly cooked fish. 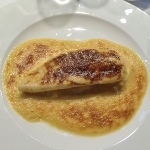 Followed a main course: Pluma Iberico-artichoke-parmesan, a little-known piece of meat, cooked a la plancha, revealed its flavors. A special mention for the wonderful home-made bread, and the butter from the family farm. The wines selected by a passionate, knowledgeable and erudite sommelier enthused the guests. In his speech, the President stressed the professionalism and kindness of the room brigade. "Au Gré du Vent", a must-mouth house Wallonia! It is in a former tannery restored with great elegance and charm that you will find L'essentiel restaurant. 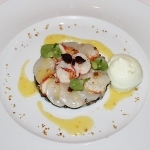 The venue invites its guests to spend a highly gourmet and delicious moment. Chef Raphael Adam, who is not unknown to the Club continues to delight gourmets over the years with a sure talent that has continued to evolve. He is assisted by a caring brigade under the leadership of his wife Bénédicte and of the experienced and enthusiast sommelier Y. Michel who commented on wines with erudition. The very menu consisted of first quality products from the market prepared with great respect by the Chef. Each preparation was cooked to perfection and presented with great thought [photos]. 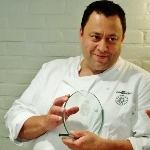 The club has discovered and applauded Chef Angelo Rosseel in Izegem in his restaurant named La Durée . The menu consisted of beautiful seasonal products cooked with respect, originality and mastery, all magnified by very tasty and light sauces. The very fresh appetizers, escorted by Billecart-Salmon Champagne Brut Reserve put the guests in appetite. 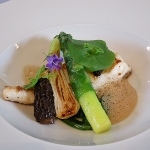 To follow: white asparagus from Belgium accompanied by a Sancerre 2012 Domaine Vacheron; turbot with fresh morels and asparagus, accompanied by a Tino 2013 Vermentino of Sardinia; Lamb from Pays d'Oc with young carrots complemented with a Syrah from the Abbey of Lérins Island St Honorat, 2004. For dessert, grapefruit, gin, lychee and ginger. In his comments, the President of the Club stressed Angelo's talent. 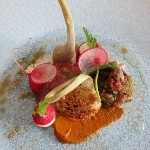 He is a former student from "Ter Groene Poorte" school and former sous-chef of Geert Van Hecke (De Karmeliet ). He was surrounded by a team of great professionals, including the young and greatly experienced sommelier Wouter D'Hondt. 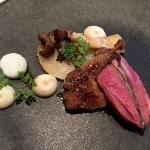 The President congratulated him for this recital of haute cuisine that delighted guests and allowed them to spend such a special moment in this beautiful maison de bouche [photos]. The Royal Club of Belgian Gastronomes delighted itself at Comme Chez Soi . At the end of their Annual General Meeting, many of the members of the Club joined to have lunch in the kitchen of Comme chez Soi restaurant. Great rejoicing! The menu prepared by Chef Lionel Rigolet was flying high and each dish wowed the gathered gourmets. 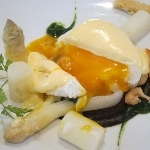 Nice presentation, refinement, lightness, harmonic range of flavors, were all present in each preparation. Lionel opts brilliantly for tradition, quality, and innovation, while maintaining the reputation of this Belgian institution that will celebrate its 90th anniversary in 2016. Note also the warm welcome of Mrs. Laurence Rigolet was also remarkable, the professionalism of the whole brigade extremely attentive to the guests. The wine selection of sommelier César Roman fully satisfied the guests. This house deserves all the praise. It also deserves to be a member of the “Grandes Tables du Monde ", a pride of Brussels! [photos]. 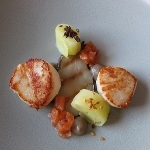 About 20km from Brussels, happiness is in the plates of Couvert Couvert restaurant, where the Royal Club of Gastronomes enjoyed a superb lunch. The Folmer brothers offer to their guests a refined and creative cuisine, using top notch ingredients. Former pastry chefs, they apply precision in each of their dishes, from ingredients' cooking to the associations of flavours and textures. The presentation of the dishes awaken taste buds and senses, one savours, one enjoys, and one applauds those stunning executions. Club members who attended the lunch were very enthusiastic with the menu which they very much enjoyed from the amazing selection of amuses to the superb desserts. The passionate sommelier likes encouraging customers to discover wines from around the world, and the staff is particularly professional and efficient. The President of the Club congratulated the team for this gastronomic performance of high level, which could deserve being rewarded by a second Michelin star [photos]. The Club returned to Le Passage restaurant in Uccle. Once more the Club applauded the cooking of Chef Rocky Renaud who has been delighting loyal customers for the last twenty year. The tasty food tends to be classical and simple, and prepared with prime ingredients. Guests particularly enjoyed the very tasty duo of European lobster and marinated scallops, served with green lentils, hazelnuts and citrus. The main course was a duck from Challans with orange and wild pepper sauce, accompanied with duck leg ravioli, chicory and amandine potatoes. It was tasted with interest. In the end, the Tahitian vanilla ice cream covered with dark chocolate and sprinkled with Morello cherries in Cointreau pleased the guests very much. The cellar contains a very good selection of wines such as Patache d'Aux 2009. This one was served with the duck. 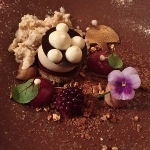 Le Passage remains one of the mainstays of the Brussels gastronomy [photos].